I love weekend mornings. They can be leisurely and relaxing and everything just seems better with a second cup of strong coffee. A short stack of pancakes also keeps that smile on your face just a bit longer too. A fluffy & almost ethereal short stack of spicy chocolate pancakes? Well, I think you’ve got the makings for a perfect day! Don’t worry, these aren’t sweet pancakes, so feel free to add liberal amounts of maple syrup to your pancakes! A touch of sweetened whipped cream certainly wouldn’t be out of line, either. 1. In a large batter bowl, mix together the first six ingredients until well incorporated. 2. In a large measuring cup, mix together the last 4 ingredients. Add the wet ingredients into the dry and lightly mix together with a fork. The batter should still be a bit lumpy and you don’t want to over mix. 3. Cook on a hot, lightly oiled griddle, using about 1/4 cup of batter for each pancake. 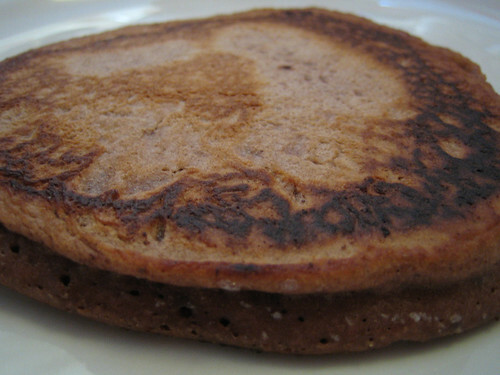 Cook until bubbles begin to form and the pancake is slightly brown on one side and around the edges; flip. Makes about 4 fluffy pancakes. Serve with maple syrup. Yum, those pancakes sound sooo good. Sometimes there is nothing better than a lazy sunday morning. Yum! I love chocolate pancakes and that this recipe isn’t too sweet! I don’t like maple syrup though, I love King’s Golden on my pancakes. Mmmm…. Okay, these sound just so good right about now… great weekend breakfast indeed! They weren’t bad, they came out a little tough on the outside and a little too gummy on the inside but the could easily be an error on my part. I might try thinning the batter next time as it was really really thick. They looked really pretty though. …and they are great with a berry sauce. 1 cup mixed frozen berries, 1 tablespoon of any sort of jam, a splash of wine in a skillet until you have sauce. Yumm… I love experimenting with pancakes. Thanks for the recipe. thanks nosheteria! lazy sundays are the best. rachel, i’ve never had golden syrup as a condiment only as an ingredient in some baked goods. interesting! yup, joe, a totally great weekend breakfast treat. mmmm, i think a berry syrup would be delicious, barista. too bad yours didn’t turn out as nicely as mine! i’ll definitely be making these again! claire, this is a great little twist on breakfast! It’s alright though I seem to have rather mixed luck with baked goods.